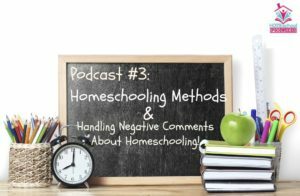 On this week’s show, we discussed 3 different homeschooling methods, and we also talked about negative comments and mindsets as it relates to homeschooling! Do you know what homeschooling method is right for you? If you are already homeschooling, what method do you use in your homeschool? Don’t miss next week’s show where I will be discussing a few other methods!